I helped host a Riesling/Pinot Noir class yesterday afternoon, part of a course Wine Australia are running for sommeliers. The idea is to boost knowledge and therefore sales of Australian wine in our restaurants. As John McDonnell put it to the class, one out of every four bottles of wine sold inIreland is Australian, but we lag behind in restaurant sales. Apparently the same is true almost worldwide. Do we all change our drinking habits once we enter a restaurant? Do we become more conservative, or is it that few restaurants offer the comfort of a well-known brand? I was partnered by Dave Palmer of Skillogalee winery in theClareValley. For me, and I think for most there, the Rieslings were the highlight of the night. The 2010 Skillogalee Riesling was a wonderful young wine, brimming with crisp ripe fruits, and a fine mineral edge. I can see how it beat 100+ other Rieslings in a recent Decanter tasting. The other highlight was a 2004 Clare Valley Riesling from O’Leary Walker (available from Thomas Woodberry in Galway, and others probably too) a super example of how this variety can mature. I also really enjoyed the youthful Plantaganet Riesling from Great Southern region and may stash away a couple of bottles. The bargain of the night was the Tim Adams Clare Valley Riesling, beginning to show some maturity, with excellent concentration, and available for around €10 in Tesco. 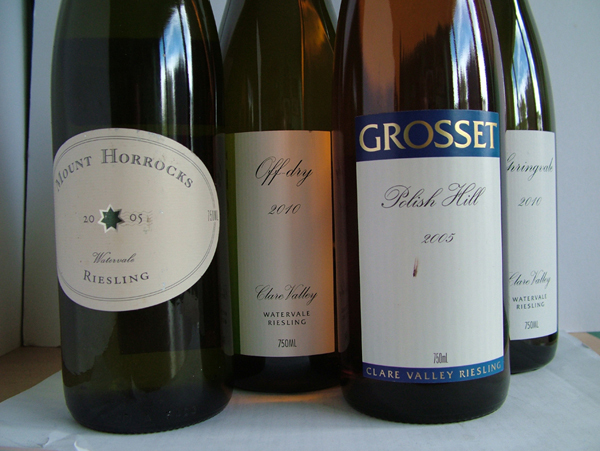 Overall, it confirmed to me that the ClareValley produces some great Riesling (although EdenValley isn’t bad either), all exhibiting a real terroir, and capable of ageing. They all come in screw-cap too, great for reliability. We only tasted five Pinots; I was impressed with the De Bertoli Windy Peak Pinot Noir, which has improved no end over the last few years. However, I am not sure it would stand up to wines of a similar price from Chile or New Zealand though. The same goes for the Innocent Bystander Pinot. Ozzie Pinot is still a work in progress.